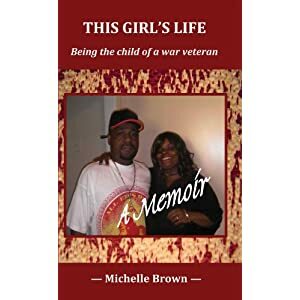 Michelle Brown’s This Girl’s Life: Being the Child of a War Veteran (Dark Planet Publishing, 146 pp., $22, paper) is a short memoir that focuses on the abuse the author underwent at the hands of her father, a Vietnam veteran. Brown’s father, Kenneth “Rico” Haugabrook, turned to drugs and alcohol after a tour of duty in Vietnam, Brown writes. And that, in turn, led to years and years of physical and mental abuse the father heaped upon the author, her mother, and her siblings. Brown survived the years of abuse, and her memoir has a redemptive ending. Today, she is happily married, has a strong religious faith, and has come to terms with her difficult upbringing. Blackhorse Riders focuses on one fierce Vietnam War engagement. It took place on March 26, 1970, in triple canopy jungle along the Cambodian border when 1st Squadron’s Alpha Company of the 11th Armored Cavalry (The Blackhorse Regiment) got into a never-named, all-day fight against the NVA. The two-hundred-odd men of Alpha troop came to the rescue of an under-strength and under siege First Cavalry Division unit (C Company, 2nd Battalion, 8th Cavalry) that had inadvertently bumped into a huge hidden NVA stronghold. Keith, a one-time U.S. Navy aviator in Vietnam, tells the story of Alpha troop’s dangerous and successful mission quite well. He also tells how the unit fought for years to be recognized for what took place that March 26, 1970. That effort came to fruition on October 20, 2009, when 119 men of Alpha troop came to Washington, D.C., where they received the Presidential Unit Citation in the White House’s Rose Garden. After D. S. Lliteras graduated from the U. S. Naval Hospital Corps School in Great Lakes, Illinois, he was ordered to the First Marine Division in Vietnam, and arrived in country in July 1968. Lliteras volunteered to serve with the 1st Reconnaissance Battalion in the First Marine Division where he was a combat corpsman and a diver (who went under bridges to check for booby traps) until July 1970. Lliteras went on twenty long range reconnaissance patrols into enemy territory during his Vietnam War tour. Why do I give so much information about Lliteras’ military service in a review of a book about firefighting? Partly because it answers the question: Why would a man choose to spend a career going into burning buildings? This man who chose to fight fires is the same man who chose to spend his tour of duty in Vietnam reconning in enemy territory. Often the enemy in Vietnam was unseen, and the dangers of a burning building are also often not seen. In both cases, though, you know that danger is there. Good books that deal powerfully with men and their work are rare. Fewer still are books written by these men. When the occasional book is written about a man doing a dangerous job, and doing it well year after dangerous year, it’s usually written by an outsider who does a few hours of interviews, some research, and observations. That author is unlikely to accompany a fire fighter into a burning building to stand side by side with a man such as D. S. Lliteras. His book, Flames and Smoke Visible: A Fire Fighter’s Tale (Rainbow Ridge, 224 pp., $17.95, paper), is exciting and well written. In it, Lliteras takes the reader inside the dangerous job of firefighting with an intensity no other writer/firefighter I have read has done, including the late Larry Brown, author of On Fire. Flames and Smoke Visible is the firefighting book that Brown’s fans had hoped for but did not get. This memoir is organized into thirty-seven chapters. The chapters have honest, descriptive headings, such as: First in Engine, Rescue Thirteen, Car Fire, Delivering a Baby, Kitchen Fire, and Third Alarm Fire. These chapter headings give a good sense of the material that Lliteras covers in his fine book, but you must read the book for the full sense of the drama inherent in fire-fighting. I read Flames and Smoke Visible non-stop, in a space of a few hours. I got totally caught up in the drama of firefighting. With the authority of experience as a firefighter, and the talent and the skill honed as the author of many brilliant novels, Lliteras has produced a beautifully written, riveting account about this profession that is entertaining and also informs, instructs, and allows the reader access to the human heart. I highly recommend this book, which is also is available on Kindle. The paperback—which will be published in March, but may be pre-ordered—features a beautiful cover showing firefighters silhouetted against flames and smoke. I also recommend that you purchase and read D.S. Lliteras’s other fine books. You will be happy you did. Deedee Wright currently interprets history and archaeology at Historic Jamestowne, the site of the first permanent English settlement in America, in Virginia. 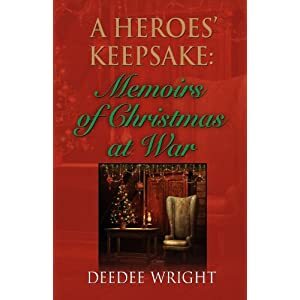 Proceeds from the sale of her book, A Heroes’ Keepsake: Memoirs of Christmas at War (Booklocker.com, 66 pp., $12.95, paper), go to Fisher House, which provides lodging to families of service members receiving treatment at military medical centers around the nation. The short book consists of a ragtag, grab-bag of fourteen pieces in many forms—poetry, verse, diary entries, essay, and missives. All are related to war and Christmas. This collection is arranged chronologically, beginning with the American Revolution, then to World War I, World War II, the Korean War, the Vietnam War, and our wars in Iraq and Afghanistan. The book is a timely reminder that America is a country made by and defined by war. It concludes with a quote from that great warrior of freedom, Ronald Reagan, and a quote from the Bible. There is an excellent list of permissions and also a bibliography. The book cover blurb promises that this small book “is filled with Christmas stories throughout American’s history in war.” It more than makes good on that promise. Buy this book to support a good cause and to get a powerful sample of how Christmas has intersected with America’s wars. 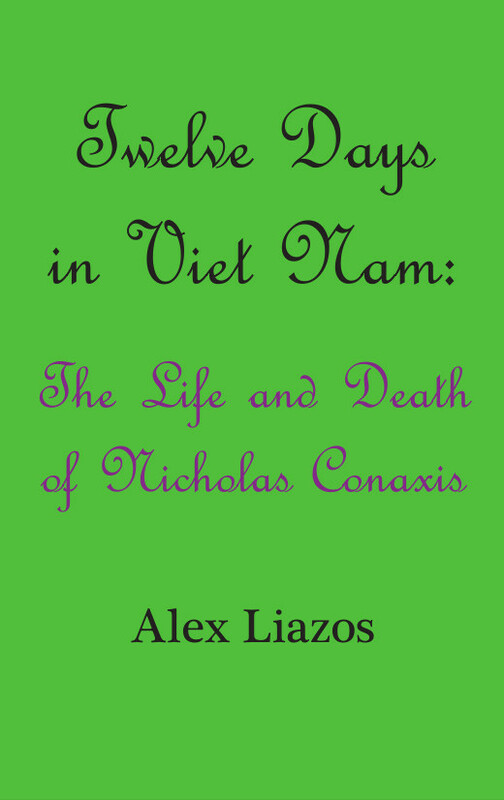 Alex Liazos’s Twelve Days in Viet Nam: The Life and Death of Nicholas Conaxis (238 pp., $14, paper) is a tribute to a young soldier from eastern Massachusetts who was drafted into the Army and who died in Vietnam in on May 5, 1968. As the title indicates, he had arrived in Vietnam just twelve days before. As Liazos shows, Nicholas Conaxis’s twenty years were not easy ones. He came from a poor family and from age one lived in several foster homes. Still, he came through that rough childhood as a friendly, admired, intelligent young man who wrote unusually observant letters to young friends, family members, and a teacher. The letters are the best part of the book. Conaxis, who served in Vietnam with the 4th Infantry Division’s A Battery, 6th Battalion, 29th Artillery, was opposed to the war, got drafted, questioned military practices and foreign policy, and sympathized with the Vietnamese. He was killed in an ambush in the Central Highlands. Much of the book is about Conaxis’s life before the Army and tells a great deal about the foster care system, along with personal details of the young man’s life and the observations of the author. Nick Conaxis’s teen-age experiences, including hitchhiking to California, and his responses to Army life—as well as his initial impressions of Vietnam and the war—should resonate with many Vietnam veterans today. Alex Liazos found and interviewed more than fifty people who had known his subject, including some Army buddies. His research is careful and as thorough as he could be forty years after the man’s death. The author, a retired sociology professor, was born in Albania and was separated from his own family for many years. He acknowledges in the book that he identifies closely with his subject’s youth. The novel begins on Saturday, May 1,1971, and ends on Tuesday, June 15. The hero and main character, Mr. Butler, is asked by a woman named Jennifer Sato to investigate the murder of her brother, Jim Sato, who was living a reclusive life in the Cascade Mountains of Washington State. Jim Sato was a friend and comrade-in-arms of Mr. Butler in Vietnam. Mr. Butler is not a lawman, nor is he a private investigator. Mr. Butler is soon informed that Jim Sato was killed by twelve rounds from an AK-47. He died slowly, but he lived long enough to scratch the letters “VC” in the dirt under his body. It looked to this reader as though the Vietnam War had followed Jim Sato home. When Mr. Butler makes the two-day trek to his friend’s primitive cabin, he spends three days systematically searching the area for clues. It is obvious to this reader that there is more to Mr. Butler than we have been told. He knows what he is doing and finds much more evidence than Sheriff Hackett and his men had found, which led me to wonder if Sheriff Hackett might be involved in the heroin trafficking that Mr. Butler found evidence of. I recollected that early in the book Jennifer Sato had said to Mr. Butler in her pleas for his help in discovering why her brother had died that Mr. Butler had “done some sort of investigating on some assignments in the Army.” That is a modest clue that Mr. Butler is a formidable investigator with a wide range of training and talents. Saxon has written an engrossing mystery with much of the story connected to the Vietnam War, and I enjoyed reading it. It is a handsome, well-edited book with well-maintained romance and adventure and intrigue. I highly recommend it to readers who enjoy Vietnam War-related mysteries. Theasa Tuohy has worked for five daily newspapers and the Associated Press. We are told that her excellent new book, The Five O’Clock Follies: What’s a Woman Doing Here, Anyway? (Calliope Press, 368 pp. $14.99), is a work of fiction, but it is a very well-researched work. I deduced from a comment about Graham Greene’s book about Vietnam being twelve years old that this novel takes place in 1967 and 1968. I was in Saigon during much of that period, and spent some time on Tu Do Street and in and out of the Caravelle and Continental Hotels where many of the scenes of this novel take place. The author nails this milieu precisely. Nice job. It’s almost as though Theasa Tuohy had been there at the time. The author’s descriptions of how the distant sky looked, observed from the bank of the Saigon River or from a floating restaurant when B-52’s were bombing ten miles away, also is spot on. It’s also beautifully written. The author’s delineation of the character and behavior of Army Colonels and CIA types is also deadly accurate. All the news folks ring true, too. But I admit I’m taking them on faith, as I spent no time with “hard-nosed newsmen” when I was in Southeast Asia. I would see them from a neighboring table in various bars from time to time, but that was it. The main character, Angela Martinelli, is believable. It is fascinating to watch her adjust to the business of gathering news in a war zone. The main problem is having to deal with the Old Boys’ Network, which mostly shuts her out of access loops. But she’s armed with a journalism degree from Northwestern and a lot of grit and determination. The character Bo Parks reminds me of a famous photographer who was in Vietnam taking great photos and taking great risks to get them. He takes to Angela, and helps her connect with the war to get stories of her own. He rings so true as to be a portrait from true life, right down to his rotten teeth and his love of Jimi Hendrix. Angela soon learns to develop her own stories and skip past the focus on body counts to write about field hospitals and war orphans. As a free-lance reporter with no home newspaper, Angela has to sell her stories in order to earn enough money to eat and pay her hotel bills. She is under the gun. Also, if the stories she writes do not jibe with the official line, the editors back home will kill them. The author has Angela Martinelli arrive in Vietnam at just the right time. She gets to report on the Tet Offensive, the Siege of Khe Sanh, the rotor problems of the Chinook—not to mention being captured by the NVA and the VC, surviving a helicopter crash, and having an affair with the most prominent and respected newsman in Vietnam. All of this is related with attention to detail and with a gift for story-telling. The book has an open-ended ending, which I hope means there will be a sequel, as I would enjoy reading the rest of the story. I can report that the book lives up to the buzz I had heard about it several months ago. I am pleased to report that The Five O’Clock Follies may be added to the short list of good, well-written books about the press in Vietnam.